I am on a mission to simplify our home. Being mindful about what we bring into our space means I spend less time shopping, organising, and tidying up. Buying fewer things that are better quality also reduces clutter and waste (which equals less stress for me as well). It has been a mind shift to really believe and act accordingly to the saying that “less is more” but I am enjoying the change in lifestyle so much. After tackling my own wardrobe, it was time to get onto the kids’! 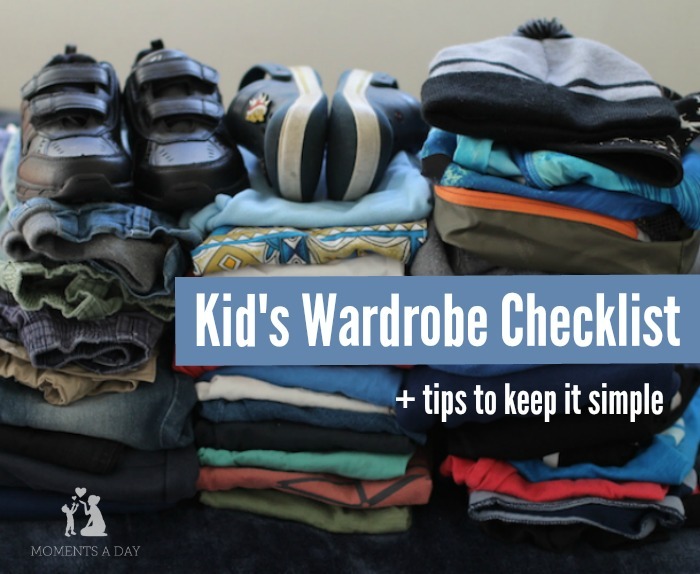 Here is my current checklist for a child’s wardrobe to last the whole year. My son got Clarks school shoes last year and we found them to be tough and durable. What I also like about the Clarks range is that they can double as “fancy shoes” for special occasions since they are black and look smart. I love being able to tick off two boxes with one purchase. With over 170 years of caring for kids feet, I appreciate the care Clarks puts into helping kids find shoes with the perfect fit with their online fitting centre. My kids also have one pair of shoes to wear to swim lessons, the beach, etc. Tip: Buying good quality shoes means they will last longer and will sometimes even be in good enough shape to hand down to the next child. I have found it is much better to buy a pair of good quality shoes than to spend a little less money on shoes that fall apart and have to be replaced after two or three months. Tip: Limiting light coloured clothing (especially white) makes for easier washing. 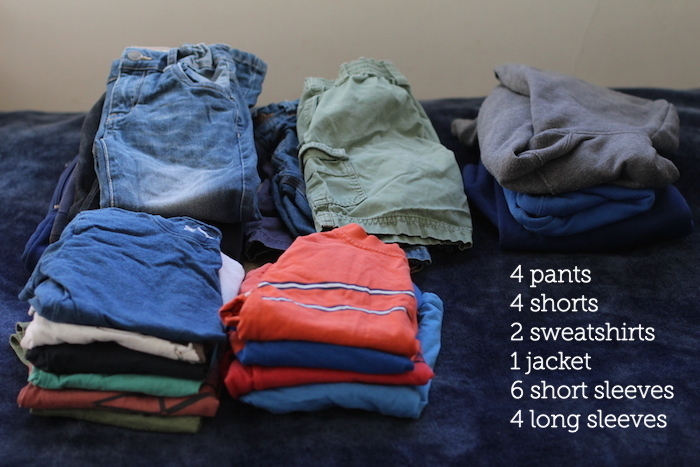 It is great to be able to wash all the clothes together in one load, and having similarly coloured items makes this possible! I like to have a week’s worth of underwear and socks per child, plus two pairs of pyjamas for each season. One of the boys’ winter PJ sets is actually merino long underwear that can be worn under their clothes for an extra layer of warmth on really cold days. This year I was also lucky to find winter pyjamas that doubled as a Halloween costume. These PJs made for a really fun travel outfit as well! Tip: Buying socks in the same colour means you won’t have trouble matching! Just make sure you buy different colours for each child, so you can easily tell whose is whose. 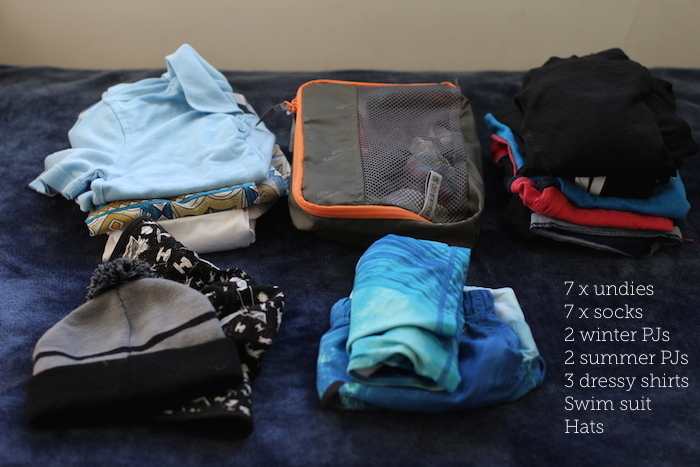 As mentioned previously, I make sure we have one pair of nice pants and one pair of nice shorts within the stash of everyday wear clothes as well. Tip: If we need something super fancy I might ask one of our family’s friends to borrow an outfit for the day, or look in a second-hand shop in the weeks leading up to the occasion. These sorts of clothes are worn so rarely that they are usually in very good condition when given away. That way I don’t waste time and money on a nice outfit that my child has outgrown before it gets worn. Tip: Sun protection is really important in Australia, so I don’t rush on finding a hat that gives good coverage and that my child really likes (this makes it easier to get them to wear it!). I might have been known to visit 8 shops in 2 different shopping centres for one particular four-year-old’s hat last year… call that a little over the top, but to me it was worth it to find one hat that he loved and would wear all the time! You may also enjoy my Back-to-School Checklist for making sure you tick off the last minute preparations for the school year. What else is in your child’s wardrobe? Do you have any more tips for keeping things simple? If you are looking for more ways to simplify your life, check out my Simple Living Series for more ideas. This is a sponsored post. As always, all opinions are my own. To find out more about advertisement and reviews on my website please click here. Such great advice Chelsea! We had a giant clean out of all our clothes during the last school holidays and took seven bags of clothes/shoes to the local op shop! I was a little shocked. I certainly found the kids needed fewer other clothes after starting school too. We keep them tidy in their drawers by folding them so they can stand up making it easy to see everything at once , not have to rifle through all the t-shirts just to find the one they want. This is so helpful. Thank you Chelsea. Oh goodness, our kids wardrobe is overflowing compared to yours! Most of our clothes are hand-me-downs, bought second-hand, or received as gifts, and the girls do like ‘dressing up’ in them, but I would like to have less, especially when I have to pick them all up from the floor! 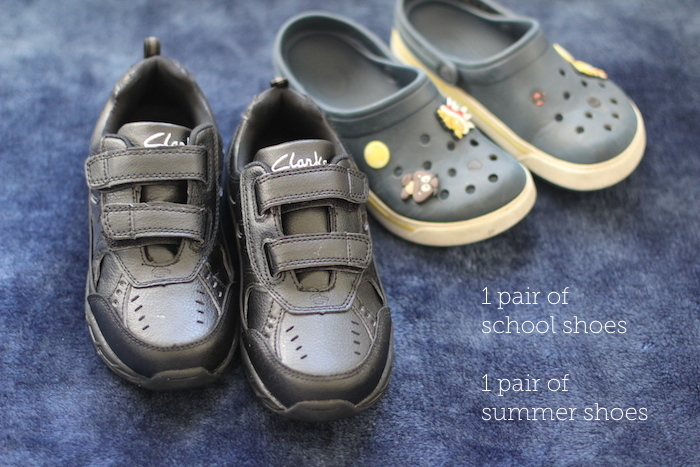 We do follow your tip of doubling school shoes as dress shoes (and play shoes) – my girls have Clarks too, and they fit so well, and are so comfy that they prefer them, which is fine by me! Ah yes school uniforms means my boys need very casual clothes! My girls on the other hand… well that’s a whole different story. Argh! I have all this stuff plus more and more. We are trying to cull everything we own at the moment so this is interesting for me. My problem is that the girls are a bit particular about what they will wear, so it’s pretty much fancy dress every day at our place, but I know that the ‘essentials’ are the most important thing so we have all that as well (never gets worn). For shoes we have lots more than that! School shoes, summer sandals, winter casual shoes, summer thongs, summer slippers, winter slippers, sneakers and sparkly party shoes. We live in new york. :/ so we have seasonal clothes… it’s so hard. LIving in Portland, OR, Bogs boots are a godsend. Really great and durable through more than one kid. I just get them around Springtime when they go one sale online. Neutral colors make it so they can get passed between our girl and boy as hand me downs. Awesome resource I’ve found here in you, thank you !